It is November, and it’s almost Christmas in the Philippines, a heavily Catholic, Southeast Asian nation recently hit by the super typhoon Haiyan. Gifts from all over the world had been pouring into the country’s Visayas region where the super storm affected an estimated 9.7 million people, and damaged 23,200 houses, as well as destroyed major parts of public infrastructure and agricultural land, according to USAID. The country stricken by Haiyan on which there is a concentration of international news headlines for the past weeks is also my home. It is the place where I grew up and returned to a couple of months ago after studying and working for several years in Washington D.C. and New York City. My feeling was surreal to be home after years of just monitoring news about my country from the screen while I was residing in a foreign land. My emotions brought about by super storm Haiyan were overwhelming but not puzzling. Afterall according to a Gallup study in 2012, the Philippines was cited as the world’s most emotional country. The absurdities and complexities that came with the bursting Filipino emotions are the very same reason why I went back home and had let go of the enticing offerings of the global financial, technology and commercial American hubs I embraced as my playground. Being home made me feel much more alive surrounded by familiar faces and made me more self-aware but also more vulnerable to an interconnected world outside my own bubble. Typhoon Haiyan also brought to the fore the special bonds formed with my international friends from various corners of the globe. Family and friends with whom I had collective stories as we experienced the paralyzed New York City in 2012 brought on by Hurricane Sandy and braved through the threats of Hurricane Irene in 2011 in Washington DC reached out to me to simply check my safety or to ask for ways to send help from abroad in their own ways. I directed some to diplomatic offices and non-government organizations who had been doing their share to unite the Filipinos abroad and at home in both blood and spirit. For example, the Philippine Embassy in Washington D.C. and the US-Philippine Society invited different organizations and proposed an initiative shoring up resources towards the goal of creating a mechanism where Filipinos in the diaspora can get engaged to address the aftermath of Haiyan and beyond. My Alma mater, Georgetown University, joined Jesuit Universities across the U.S. in marking a Day of Solidarity with the Philippines. Members of the campus community were invited to participate in this day via several fund-raising and commemoration activities igniting unity in a highly diverse campus with international students coming from more than one hundred countries. “The fast approaching holiday season now has a different tone brought about the recent Haiyan tragedy as news from the site volunteers shares authentic stories of hope, optimism and restoration”, said Tito Cajulis of Gawad Kalinga, one of the few non-profit organization based in the Philippines with appeal and networks all over the world, dedicated to eradicate poverty and restore human dignity. For me, this 2013 holiday season sparks a fresh significance. After spending my past four years of Christmas surviving bitter cold winter nights in the company of transient friends, I am thrilled to spend the warmth of the holidays in the Philippines this year after a hiatus from the comfortable smiles I grew up with. I was fully ready to embrace the chaos I had been used to and Super storm Haiyan just reinforced my paradigm shift brought about by my enchanted U.S. Capital and Empire State of mind immersion. I have seen for myself the renewed essence of holiday giving and community-building that goes far beyond the commercial festivities, religious affiliations or country of origin. I am awed by how my diverse and fragmented society stands united in times of catastrophe, and will make the rebuilding of destruction, healing of injuries and further progress as a country possible. A lot of my peers observed that how they knew me before I left the Philippines is entirely different from the one they welcomed back for good. I am grateful for the transformation from the rough and tough course of nature. I am finally home -with or without Haiyan, for better or for worse. In preparation for our Georgetown University and the American Marketing Association, with the Support of the International Trade Administration of the U.S. Department of Commerce March 14-15, 2013 Conference, I met with the Ambassador of the Republic of the Philippines to the United States- Amb. Jose Cuisia. 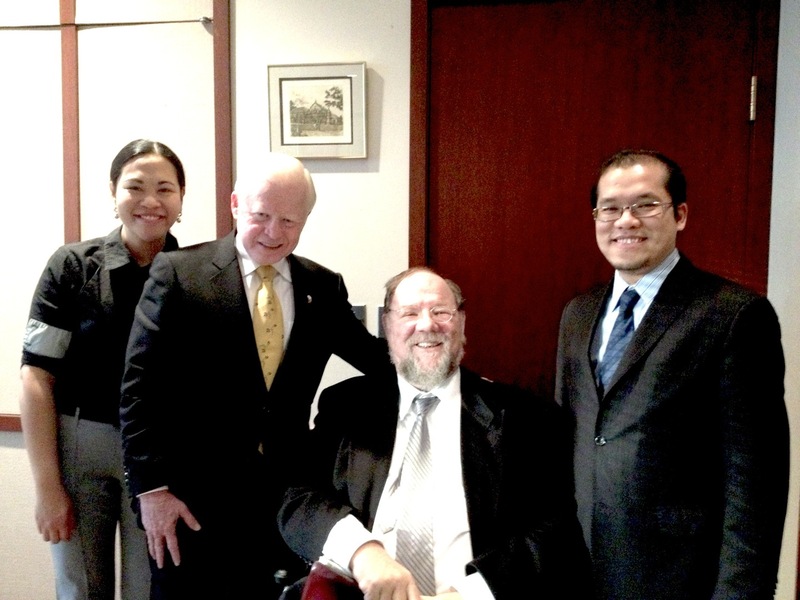 This photo was taken last February 12, 2013 at the Embassy of the Philippines in Washington, D.C.
• Professor Michael R. Czinkota teaches International Business at Georgetown University in Washington D.C. He can be reached at michaelczinkota.com. Ireene Leoncio is a graduate student from the Philippines at Georgetown University and serves as President of the Graduate International Student Association.